Voice is about workers at a 112 emergency call center who have had family members murdered by a serial killer. While on the hunt for the killer, a “Golden Time” team is established to rescue crime victims in the golden window of time before they are likely to be killed. Jang Hyuk plays Min Jin Hyuk whose wife was brutally murdered by the killer. His gruff personality can be off putting, but he is an upright and just man. He is also determined to find the killer no matter what. 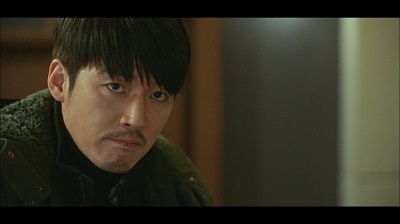 Of course, I’m always a fan of Jang Hyuk, but I don’t think this role gave him a lot of opportunity to shine. He put forth a top notch performance as usual, but his character was what was really lacking in this case. We then have Lee Ha Na as Kang Kwon Joo. Her father was also murdered by the killer, and she has been trying to find him for years. She has exceptional hearing which allows her to pick up on small things while on a call that helps the team find the victims. She and Min Hyuk eventually find themselves working together to catch the serial killer. Voice is a very dark and gritty crime drama. It’s violent, bloody, and quite disturbing. I was pretty worried before I started the drama since I had been reading other viewer’s reactions to it being so unsettling. The rating of the drama was eventually even bumped up to 19+. It’s definitely the most violent kdrama I have ever watched. But much to my surprise, I ended up handling it fine. I’m pretty wimpy when it comes to anything involving gore, but I didn’t find Voice to be on the gory side. Yes, it is very violent, but not really more so than some American network crime shows. It’s just not as common to see this kind of thing in dramaland. Also, I think the way in which they depict some of the crimes is on the more realistic side which may be why many viewers found it so unsettling. But it never actually showed the most violent parts on screen and blurred out much of the actual gore. But like I mentioned, it is still very violent and bloody. It is disturbing, and a lot of the crimes are very unsettling for sure. This is a gritty drama, and if you’re sensitive to those elements, I would definitely avoid this one. It’s certainly not the kind of drama I actively seek out, and it’s out of the norm for me to watch a show like this. The main positive to the drama for me was the excitement in the beginning. If you’re looking for some thrills, Voice is a good fit. With the Golden Time clock in play, many of the crimes have only a short amount of time before the victim could be murdered. This made things pretty exciting as the team battled the clock to save them. The first quarter of the drama was where this was executed best, and I was definitely on the edge of my seat. I do think the drama lost a lot of that initial thrill factor as it progressed though. Many later episodes incorporated the use of some of some classic detective skills to solve crimes which I only find moderately entertaining. Voice also has its fair share of plot holes and a constant stream of moments where the detectives do illogical things. 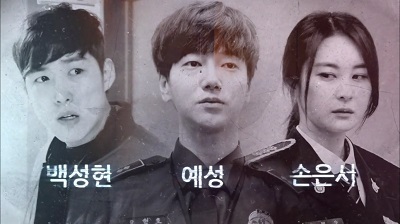 The main negative for the drama was the characters. I was never able to get very emotionally connected with our main duo. The show set up our main characters and the back stories well, but then the concept of character development pretty much fell to the wayside. The drama mostly just shows them in constant pursuit of criminals. They felt very one dimensional with almost no character development at all. This was incredibly disappointing since the story itself was quite good. The supporting characters were also pretty basic although each did get a little time in the spotlight which made for some interesting cases. The last couple episodes do see a bit of last minute character development, but it was far too late in the drama and still pretty minor with the most development surprisingly coming from a supporting character. All that being said, Voice was still pretty entertaining overall. Probably the most interesting character was the killer himself, Mo Tae Goo, played by Kim Jae Wook. Although still fairly one dimensional as the classic serial killer type, Tae Goo is fascinating as a character. While the other characters remain pretty stagnant, we do get to at least peel back the layers of Tae Goo to see what makes him tick. He’s also a more lively and entertaining character. This combination just made him far more interesting than everyone else around him. And of course, Kim Jae Wook put forth a very impressive performance. So overall, Voice did well by giving some initial thrills as well as a decent serial killer story. But the one dimensional characters that experience little growth was extremely evident and definitely brought the show down. Voice definitely had some great moments, but it also could have been so much more. This entry was posted in Reviews and tagged Jang Hyuk, kdrama, Kim Jae Wook, Korean Drama, Lee Ha Na, Voice. Bookmark the permalink. You nailed the strengths and weaknesses of this show. I agree on most of your views, with lack of character development being the aspect that bothered me the most. The best aspect to me was the victim’s stories and their portrayal. The show has its frustrating moments but all in all I found it entertaining. I guess, it has its merits. I wasn’t fascinated by the killer like the majority tho. To me he was as meh as the main leads but had less time to deflate. Yes, the lack of character development was such a glaring issue, and it really surprised me how stagnant everyone stayed. And even I thought the killer was also pretty one dimensional. I think for me this drama is a case where when all of the other characters were barely being looked into, the killer’s character actually seemed to have more of a story which made him interesting, especially in the second half of the drama. But I always like a good portrayal of a serial killer too even if it is pretty stereotypical. So yeah, definitely lots of problems, but it was entertaining enough. This drama is extra ordinary. Most korean dramas are love story, even in those detective drama.this one is the first one giving you the feeling like criminal mind or like Stephen king’s books. Yep, pretty typical crime format, although I thought it was more intense than most. This is a good story I found but Impostora is also an outstanding awesome story.